Homelessness has bedeviled Greenfield and the region for years. An overnight “emergency” shelter was established with state money decades ago, yet the emergency never ends. Greenfield is home to three shelters that nonprofit ServiceNet runs: the overnight shelter with 20 beds, a shelter for families and one for single women. Over the years from time to time, especially in the bitterest winter months, local churches have pitched in temporarily. But the root problem never seems to retreat, and the shelters are never quite sufficient. 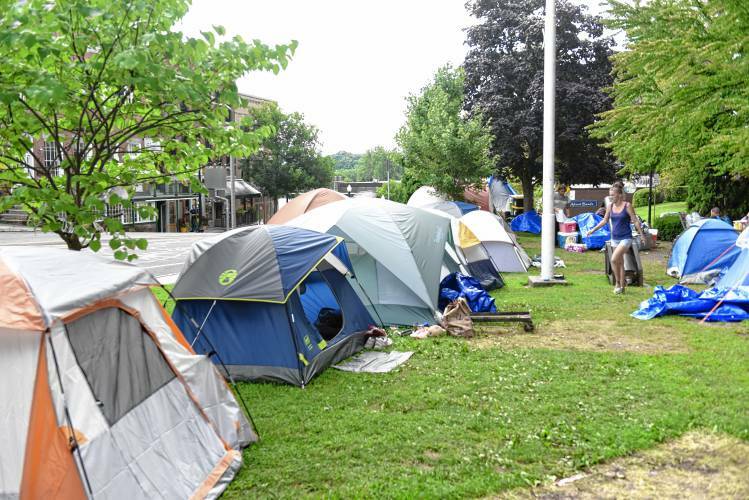 The homeless tent town on the Greenfield Common this summer pushed the plight of the homeless in our faces, although we doubt — as some have suggested — it was done as a public protest. A few homeless people found the common a safe and inviting campsite and were allowed to stay, and so attracted others, eventually growing to about 20. And why not stay, when the kind-hearted residents of the town provided tents, beverages from Greenfield Coffee and fruit from the farmers market. But it was never a good idea for the town or the campers to have them living in the heart of downtown. The mayor’s administration initially thought it could not evict the tenters because city ordinances didn’t specifically include the common among city parks with hours of admission. Belatedly the health board and licensing commissioners determined they indeed had the legal authority to evict the squatters, and they did. So things returned to normal on the common, and city works crews have reseeded the grass there. But for those still left homeless things aren’t normal. Some of the tenters moved to a shelter in New York, others have found beds at the shelters and others have simply moved off to more discreet camp sites — some by choice, some by necessity. We were glad to hear that ServiceNet with an assist from the city plans to enlarge its emergency shelter to accommodate more beds starting this November, when the weather will start to turn against campers. That’s a good short-term fix. But the community needs to work on a longer term solution. MJ Adams, the mayor’s point person on this issue, says city and social service leaders are thinking longer term and hope to arrange for more single-occupancy rooms rather than simple shelter beds in a common space. Such a facility would give homeless people their own bedrooms, with a living room, kitchen and bathrooms as shared space. This is still very much in development, though. We hope that this effort won’t just fade away, because homelessness is a deeply rooted and tough problem to solve. We were encouraged by discussions about this issue among the county’s religious leaders this week. It shows that while the homeless have been moved from the heart of downtown, the people with heart in Greenfield haven’t given up on the homeless. And while we doubt this problem will ever entirely go away, we would encourage those clergy as well as the city and human service agencies to form a long-term alliance and task force to reduce homelessness as much as possible. The plan to quickly provide more shelter beds for the homeless, especially those who had camped on the Greenfield Common for nearly two months this summer, has hit a snag. “We need more shelter beds and it really doesn’t matter who is running them,” said Adams, who is now working with ServiceNet, which Mayor William Martin in August complained wasn’t doing enough for the homeless. Besides the overnight emergency shelter, ServiceNet runs two other shelters in Greenfield: a shelter for families and one for single women. Some of the Common campers said they dislike the ServiceNet overnight shelter, saying it is too cramped. Adams said the city helped to arrange beds for three of the Common homeless on the final day of the encampment and the three of them declined.